The Chinese New Year begins February 5, 2019. 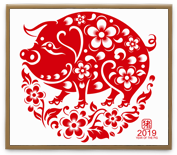 It is the year of the Pig! The animal that represents you in Chinese astrology helps to determine your personality. Include your entire birth date below, and I will send you a mini personality reading for only $10! Fill out all information below, then pay for your reading at Paypal’s secure website and voilà, I will send you your mini-reading! Please note: You have my assurance, your email address is never shared with anyone else. I had Sunita do a numerology chart for me several years ago. I refer to it all the time. When I heard she was teaching a class I had to take it! With the job I have, I meet and have to work with all kinds of people. Knowing how to calculate their numerology helps me to better understand their personalities and where they are in their lives at that point in time. This helps me relate and communicate with them. My numerology chart gave me a deeper understanding of my personality and why I do the things that I do. This is the one thing that I am most grateful to Sunita, it has cleared up a lot of questions for me about myself.